Sorry, boys, she’s no longer available. 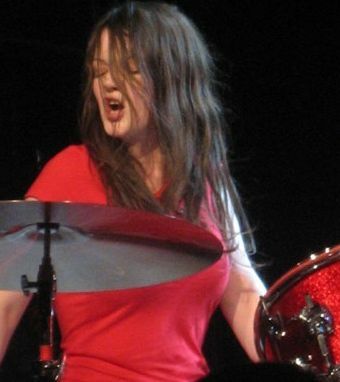 According to the Detroit Free Press, Meg White is getting married. Who’s the lucky guy? Turns out it’s none other than Detroit rock royalty: Jackson Smith, son of Patti Smith and the MC5‘s Fred “Sonic” Smith. Smith, who grew up in St. Clair Shores, was 12 when his father died in 1994. He moved with his mother two years later to New York City, returning to Michigan after high school and impressing local music fans with his intuitive guitar talent. White and Smith, who became close last summer, are known around town as private but personable figures. They live together in White’s Detroit home, and got engaged several weeks ago. Congratulations to the happy couple! The date is set for May 22 in Nashville. We’ll be watching the mailbox for our invitation. Photo by Russ Turk for Glorious Noise, 2007.
i must say, for two big reasons – i’m a bit heartbroken. I wonder if Jackson had to to ask Jack for Meg’s hand in marriage? kick out the gams, motherf…..s!!!!! Hey, are you guys talking about boobies?